Archer spent six years in the NFL from 1984 to 1989, mainly with the Atlanta Falcons, but also with Washington and San Diego. His best season were 1985 with 312 attempts for 1992 yards and 1986 with 294 attempts and 2007 yards passing. In 1990, Archer was drafted by the Sacremento Surge of the WLAF in 1990, and returned briefly to the NFL with the Philadelphia Eagles before coming to the CFL. 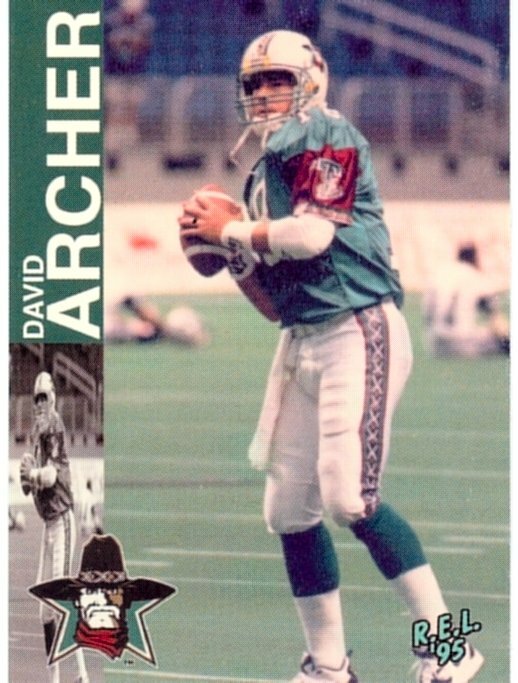 Archer signed with the expansion Sacremento Goldminers in 1993 and had one of the best years passing in CFL history with 701 attempts, 403 completions, 35 touchdowns and 6023 yards. Those are career numbers for more than a few QBs in CFL history. Limited to nly 12 games in 1994 for Sacremento due to injuries, Archer's numbers dropped, but he still threw for 3340 yards. In 1995, the Goldmners relocated in San Antonio and signed Archer who had been a free agent. With the Texans, Archer threw for 4471 yards and set a new career high in completion percentage with 61.4%. Archer was drafted by the Ottawa Rough Riders in the dispersal draft when the American expansion failed and threw for 3977 yards in 1996. Unfortunately, Ottawa folded after the 1996 season and Archer went West to the other Roughriders in the dispersal draft, but retired before the 1997 season. He came out of retirement in 1998 as a free-agent signing by Edmonton, completing 55.8% of his 362 passes for 2860 yards.